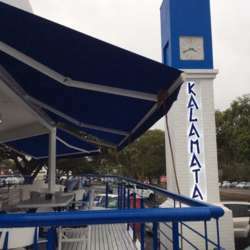 New among some gems lining "restaurant row" in Mackeurtan Avenue, Durban North, is Kalamata: Crazy Greek Kouzina. The family who have opened Kalamata (already known in Durban for their great food) have gone for authentic Greek style and atmosphere and promise Greek dancing for good measure. "We pride our original home-made style of cooking and welcome you to the original experience of a traditional Peloponnese feast," they say. We will meet at Kalamata from 6pm (kitchen closes 9:30) and managers Yvonne and Mdu will hold a great "lounge" space with tables INSIDE the spacious restaurant for our group. Look for the InterNations welcome sign. Kalamata has a great menu comprising Greek village dishes and authentic fare. Naturally a full bar. As always, all food and drink for our own accounts. First-timers, please make sure to introduce yourselves! And regulars, please make a point of meeting and chatting to as many other InterNations "internationalists" as you can. The membership draws a great bunch. Everyone I chat to has interesting ideas and stories. Move around. Switch tables. Mingling is part of what it's all about. There is good street parking along Mackeurton Avenue. Well organized car guards. See you there!